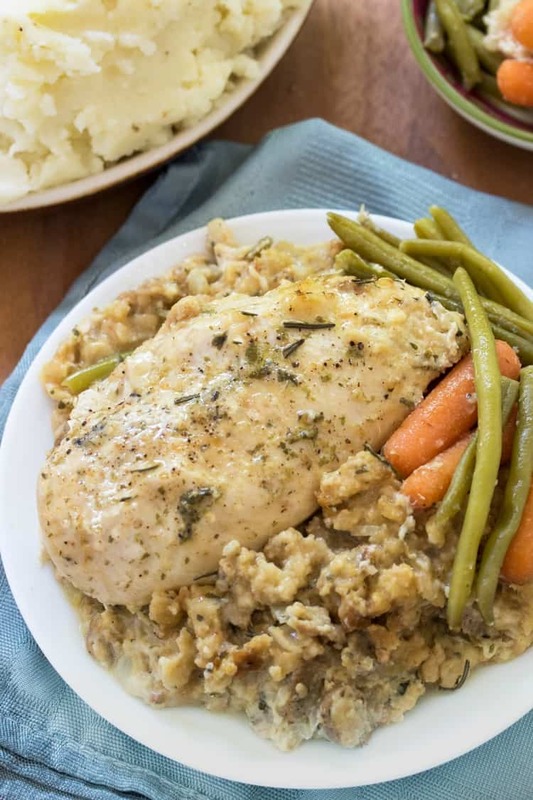 Extra-juicy chicken and savory stuffing simmer together in the crock pot with your favorite vegetables for an easy, comforting meal that the family will love! Welcome welcome, to one of the most popular recipes on the blog! You must have really good taste to have landed here. 😉 I suggest slapping a bookmark on this recipe now and calling it a day, because you will be back to make this again. All Crock Pots Cook Differently. Leave the lid off for the last 30-40 minutes of cooking to let some of that moisture escape. You can also pop the stuffing in a 350 degree oven for 10-15 minutes or until it reaches the desired level of consistency. My Crock pot of choice: I recently purchased this crock pot and love the way that it cooks and conducts heat. You can also sear meat right on the stove-top with this prior to slow cooking! 1 cup evaporated milk + 1 tablespoon vinegar or lemon juice. Let stand 5 minutes to thicken. Campbell’s makes a low-sodium Cream of Mushroom soup that is a great substitute for the Cream of Chicken. Low-Sodium Chicken Broth is always a safer option, you can always add salt, but you can’t really take it away. You can also wait on salting the chicken until you’re ready to eat, you may not find it necessary! No problemo! 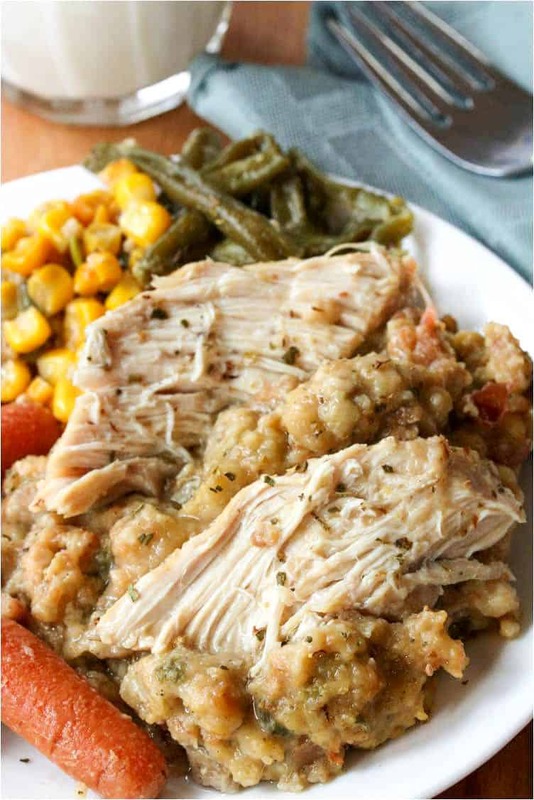 Instant Pot Chicken and Stuffing will do the trick, check out the recipe here! Sign up for my free email list to get a weekly notification with my latest recipes! Then, after that, follow me again on Facebook, Pinterest, Instagram, I’m everywhere! 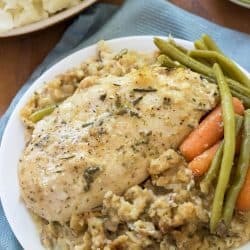 Extra juicy chicken and savory stuffing simmer together in the crock pot with your favorite vegetables for an easy, comforting meal that the family will love! 4 boneless skinless chicken breasts, salted and peppered if desired. Place the chicken on the bottom of the crock pot and sprinkle with salt and pepper if desired. In a large bowl, mix together the soup, sour cream, stuffing, and half of the broth. Layer the stuffing mix over the chicken. To keep the vegetables separate from the stuffing, place a layer of foil over the stuffing, then place your vegetables on top of the foil. Poke holes on the bottom of the foil to allow the moisture to circulate instead of collecting on the top of the foil. You can also layer the vegetables right on top of the stuffing if you’d prefer. Cook on high for 4 hours, or on low for 6-7. Before eating, check on the stuffing. If you’d prefer additional moisture, add the rest of the chicken broth, stir, and heat for an additional 10 minutes. Garnish the chicken with parsley if desired! I personally like to stir the stuffing mixture occasionally to gauge the moisture level, but this isn’t necessary. Nutritional facts include the optional ingredients listed as well. Are you supposed to cook the chicken before putting it in the crockpot? Hi Kelsey, no- the chicken goes in uncooked, it cooks in the Crock Pot. Can you cook the veggies separately? Or do they need to be cooked together? Hi Allison!! You can absolutely cook them separately!